Lone Snow Gum, Kangaroo Ridge. Gelatin-silver photograph on Fomabrom Variant 111 VC FB photographic paper, image area 21.4cm X 16.3cm, from a 67 format Efke IR820 rollfilm negative exposed in a Mamiya RB67 single lens reflex camera fitted with a 50mm f4.5 lens and a IR680 filter. Titled and signed recto, stamped verso. There is no special processing of the materials used. 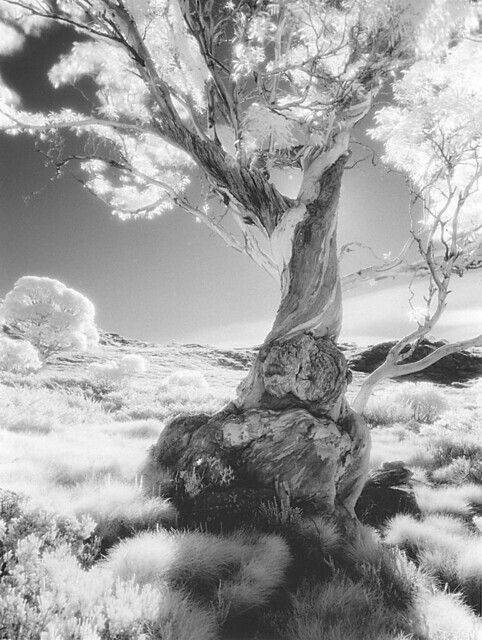 The tonal result is a consequence of infrared film, an infrared filter, a nice tree, and a sunny day! Oh, I love infrared and I doubly, perhaps even tripely love this image. Stunningly nice! I don't know whether you noticed, but there's a girl asleep near the base of the tree, she's bent over, her face is to the left with her black hair laid out behind her. Alas, Asher there is no girl. You are a thrall of pareidolia. But it's ok. Romantic pareidolia always lends grace to the visionary. No thrall, was never traded by Vikings! I'm just a romantic. I see the best in things. Just given two threads I can make a dress and the woman inside it. It's exporting this into a material form, that's the challenge here. I am so glad I didn't mention the lion as well, but thought better that his position was rather..well, I won't say...now you can see this for yourself. Double pareidolia. Got it! Magnificent. but he won't eat the girl! He's just posing for Maris, LOL! And I didn't even see a hint of Rousseau in this image. Very wonderful image and great application of IR.